After the death of the last Medici, Grand duke Gian Gastone, the important European countries in Vienna decided to give Tuscany to Francis I duke of Lorraine (french-austrian dynasty). He was succeded by Peter Leopold I, Ferdinando II, Ferdinando III, finally by Leopoldo II. With the arrival of the Lorraine family in Florence revives the town's economy, it unfortunately also accentuates its provincial mentality which prevents Florence from participating in international cultural expansion and the consequences for the town last, strangely, for a long while. The techniques of Ammannati and Buontalenti greatly influence architecture: this is seen in the works of Pierfrancesco Silvani (Palazzo Corsini), Foggini, (Palazzo Viviani della Robbia, in Via Tornabuoni, the Corn Warehouse in Piazza Cestello) and, at the turn of the 18th Century, Ruggieri (facade of San Firenze church). 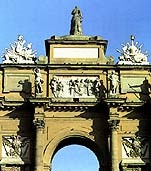 In the mid-18th Century, when international culture is once again more open to discussion, the Lorraines called the Frenchman Jadot to Florence for their neo-Classical arches. 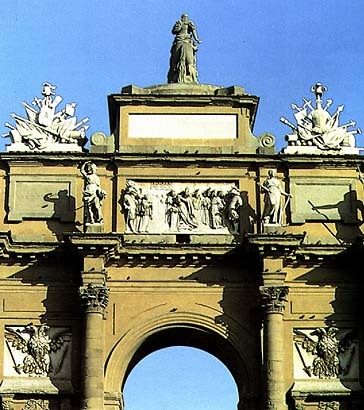 Neo-classicism in Florence is of strong historical flavour, good taste and elegance (the little Meridiana palace in Boboli, the White Room in Palazzo Pitti, the Niobe Room in the Uffizi gallery and the facade of the Villa Poggio Imperiale by Gaspare Maria Paoletti). Meanwhile Baccani restores the Teatro della Pergola. The Livia palazzina in Piazza San Marco (1775) seems to reproduce a town version, in miniature, of the style of the villas and 19th Century country houses which invade Florence during the Napoleonic period, when great urbanistic expansion was underhand. Via Larga is lengthened, two new bridges are built and the roads along the Arno banks (Lungarni) are extended beyond the city walls, whilst the poor districts become more and more built-up. When Leopold II of Lorraine again gained control of the town, assisted by the Austrian troops, in an atmosphere of imminent social crisis and flare-up of class warfare, the ideals of beauty and elegance of the neo- classical period are substituted by the enlightening theory and hope in the return to nature and the liberty of mankind. The increasing contrast between the expansion of the new residential districts near the city walls and the disquieting continual increase in the number of people living in the poor quarters (in 1835 an epidemic broke out in the area around the Old Market place), are the main cause of social warfare and revolutions, whilst the birth of industrial economy emphasizes the problem of the working classes' conditions.